In 1978, Alacer Corp., based out of Southern California, introduced a simple Vitamin C plus minerals with B Vitamins dietary supplement drink mix, which was quickly embraced by people seeking a refreshing way to support a healthy immune system. 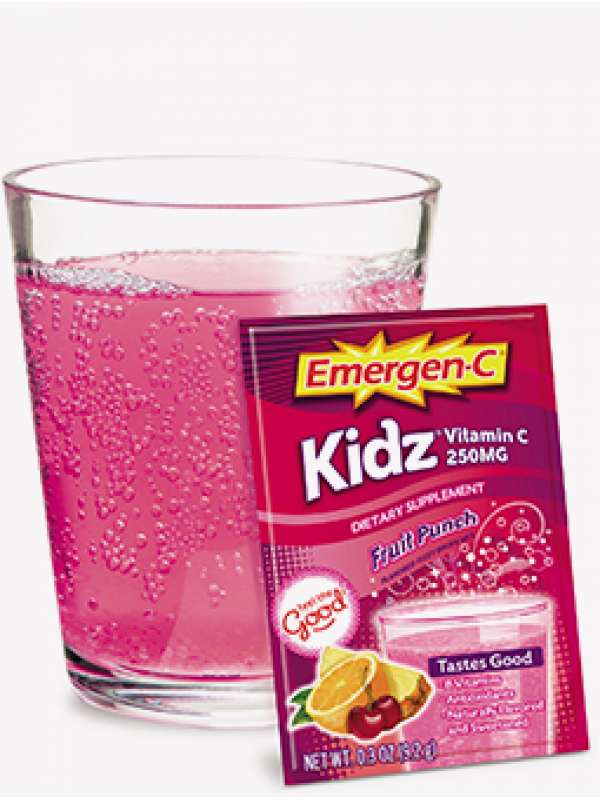 * News of this fizzy sensation spread and Emergen-C vitamin drink mix found an impressive following, more and more people began mixing up the original citrus-y flavor to feel the good every day. 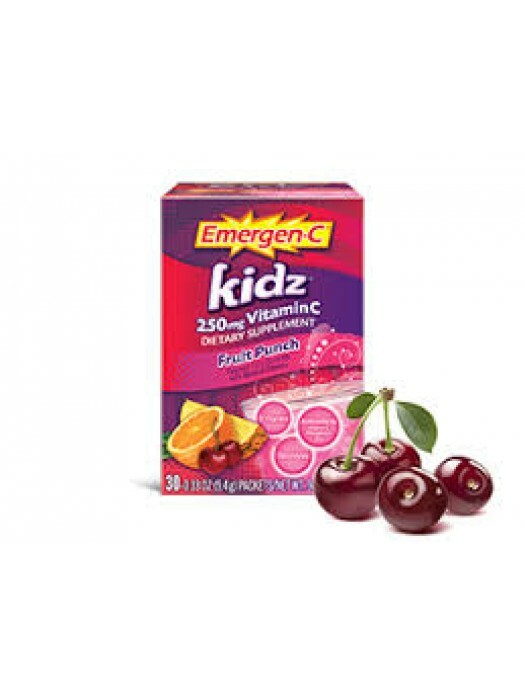 Emergen-C Kidz® offers everything you love about original Emergen-C, but formulated especially for kids. Mix up some fizzy fun every day with 250 mg of vitamin C, antioxidants†, B vitamins and electrolytes. Other Ingredients: Fructose, Citric Acid, Maltodextrin, Dried Fruit & Vegetable Juice Concentrates (pineapple, peach, beet, orange) (color and/or flavor), Malic Acid. 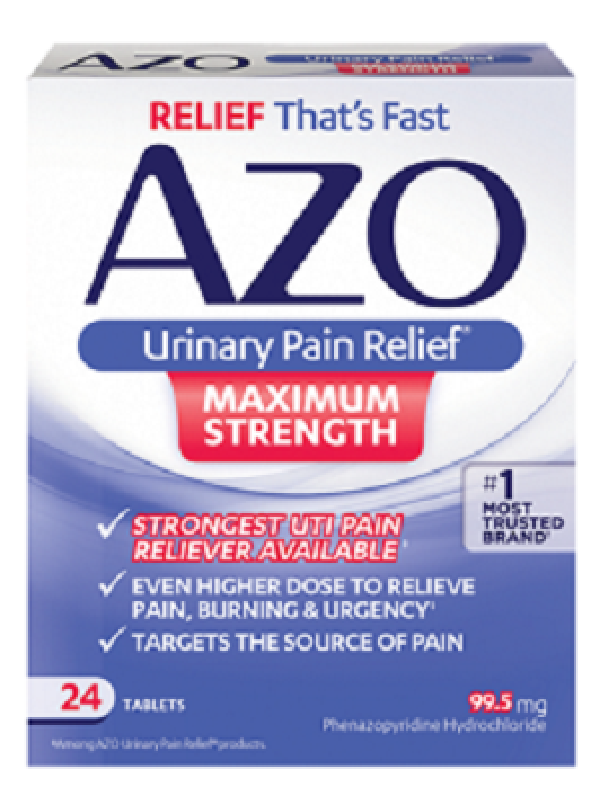 Contains <2% of: Fruit Juice Solids (guava, strawberry), Glycine, L-Aspartic Acid, Natural Flavors, Orange Oil, Rebaudioside A (extracted and purified from natural stevia leaf), Silicon Dioxide, Sugar, Sweet Cherry Powder, Tartaric Acid. Directions: Ages 4 to 13, one (1) packet daily. Empty contents into a glass, add 4–6 oz of water, stir. For lighter flavor, mix with more water. Do not exceed suggested use. If child is taking medication, consult a doctor before use.